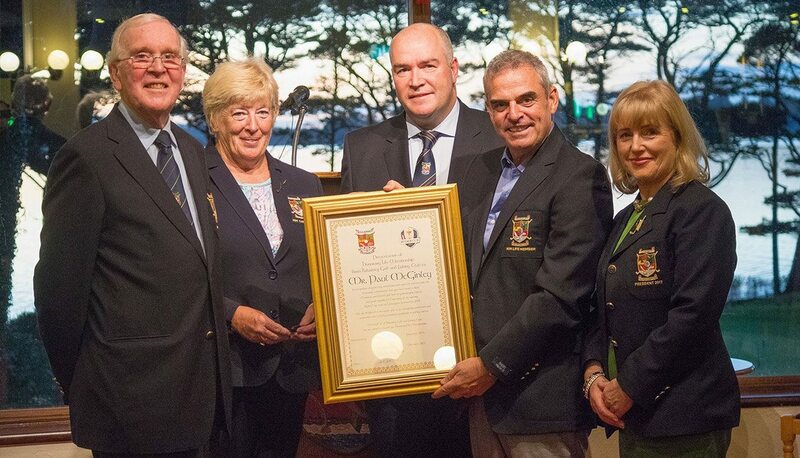 Killarney Golf & Fishing Club honoured Mr Paul McGinley at a special reception on Thursday 26th October. Paul was awarded the club’s highest honour, that of Honorary Life Membership, in recognition of his outstanding achievements and enormous contribution to the world of golf. Paul won four European Tour events, was the winning Captain of the 2014 Ryder Cup, which took place at Gleneagles in Scotland, and was the first Irish man to Captain the European side. Furthermore, he famously holed a 10-foot putt to win the 2002 Ryder Cup for Europe. Paul McGinley has had a long association with Killarney having played his first Irish Open as a Professional here in 1992. The first time he represented Ireland on the Irish Youths Team was also at Killarney Golf & Fishing Club. ‘I’m really honoured’, said Paul. ‘A club with the esteem of Killarney Golf & Fishing Club, I’m very proud to say that I’m a member here, and I look forward to bringing my family here to visit’. Club President Breda Duggan, Club Captain Derry McCarthy, Lady Captain Sheila Crowley along with former Club President Denis Cronin were on hand to present the award of membership to Paul McGinley. He was welcomed to the club by many of the Club’s former Presidents, Captains as well as existing Honorary Life Members. Paul gave an address to those present and this was followed by a Q&A session. The occasion coincided with the launch of the Club’s 125th Anniversary which will take place in 2018. The Killarney Killeen course was voted the best parkland course in Ireland by the IGTOA – golf tour operators association who depend on client feedback, your best judges. Offering great value for money in majestic settings along the shores of the world famous Lakes of Killarney and MacGillycuddy Reeks mountain range. It is a must play for those needing a break from the links golf, and where an adequate number of buggies are available. Killarney is probably the best value golf in Ireland with 2 courses on site.